Whether it be a tabletop that can be adjusted up and down or one that has a surface that can tilt forward, one discovers the flexibility that a good drawing table can provide. There may be wood tables that blend with the furniture, however a metal surface is a stable and smooth surface for drafting or design. If you want to lay out your work on a larger surface, use a large drafting folding table that's approximately 36 by 80 inches. It has a comfortable height to allow an artist, engineer, or architect to lay out several designs. Finding a table that adjusts up and down and has a smooth flat surface is the best for an artist. Using a wood surface can alter a painting because there are small holes in the wood and trying to blend in the depths of the color with the blotch that was made because of an imperfection in the wood surface can be very difficult. This type of table has a frame at the bottom so when it is tilted at an angle the drawing utensil does not roll off on the floor. This can be very frustrating if you have the wrong type of table. Engineers and architects use metal surfaces because they are smooth and their drawings need to be accurate within a fraction of a centimeter. They work on precise drawings for buildings, motors, and other project designs, so it's imperative that every part fits together perfectly. One mistake can destroy the whole project. Modern styles and features are here for a reason. For example, the wider split tabletop surface is good for computers. An easy access adds to the specific requirements one may need depending on the type of work they do. A split top drafting table can be a very convenient way to keep drafting supplies and tools handy without disrupting the work space. Most of them still allow angle adjustments to raise or lower the drafting portion of the table with ease for drafting in an adjustable height and width from 30 inches to 84 inches. Keep in mind that the surface of the drawing table is paramount. The most advanced adjustable ones are made of steel, but one of wood has its own traditional style appeal. ne online to find out the kind of table that would be conducive to you. For example, you may want a small table such as 30" by 36" for small drawings or for homework if you are a student. Even these tables should have a storage area for pens, pencils, paper, and even a laptop. This is possible because some have a shelf under the surface to slide a computer underneath. 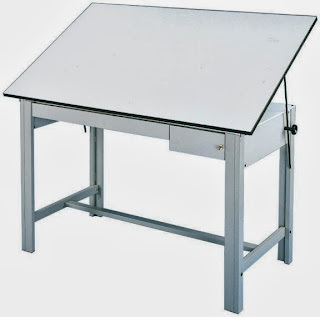 Looking For the Best Drafting Table?